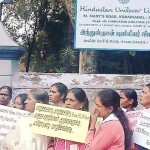 In a rare gesture, the international scientific community is joining hands to express solidarity with ex-employees and local residents exposed to toxic levels of mercury in Kodaikanal — the princess of hill stations — where Hindustan Unilever Ltd (HUL) allegedly committed the unpardonable sin of dumping toxic mercury close to human settlements that threaten the lives of hundreds of people and virtually turns Kodai into the ‘Bhopal of Tamil Nadu’. The Anglo-Dutch consumer goods giant Unilever, which owns 67 per cent stake in Hindustan Unilever Limited (HUL), still lives in denial about allegations of mercury poisoning in Kodaikanal. Replying to questions raised by campaigners in the United Kingdom for justice in Kodaikanal durig the recent annual general body meeting held in Leatherhead, UK, on April 30, Unilever CEO Paul Polman said it was a long-term issue and that they wanted to resolve it.